Keep in mind, this is just the layman's 37-second version of this concept. For the serious NBA fans, there will be a much more in-depth analysis at some point down the road, probably on CelticsLife.com. The league's salary cap is currently right around $67 million. 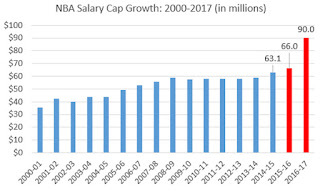 Because of the giant new TV contract that begins next season, this summer the salary cap will jump to about $90 million. For the most part, every single NBA team will have at least $23 million to spend--some clubs will have a lot more. For example, the Celtics are only committed to around $34 million in contracts for 2016-17, leaving $56 million potentially available. There aren't going to be enough available free agents for teams to reasonably spend all their money. Bad players will end up getting the type of deals that had previously been reserved for stars. Some clubs will be forced to pay guys they don't even want, just because. That is not something that we modeled for. ... But we'll see what happens this summer. I mean, as I've said, there will be unintended consequences from all this additional cap room this summer. I just don't know what those consequences will be.